In Malawi and Uganda, women’s roles center on marriage and motherhood, household duties, and caring for family members and the sick. Women are supposed to consult their husbands and accept their decisions about household and health-related issues. Men’s roles are to lead and represent the family and to earn income for household expenses. Men frequently have more than one wife or girlfriend, which is considered a sign of masculinity, whereas women are expected to be monogamous. 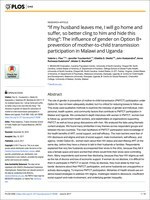 These gender roles may constrain women’s access to health services, including participation in programs to prevent or eliminate mother-to-child transmission of HIV. Countries worldwide are working to achieve the goal of having 90 percent of people diagnosed with HIV on sustained antiretroviral therapy (ART) by 2020. Maintaining 90 percent of HIV-positive women initiated on lifelong ART under the Option B+ prevention of mother-to-child transmission (PMTCT) program has been challenging. Other studies have documented barriers to PMTCT, but few of these were conducted under Option B+, and they did not specifically consider how gender influences PMTCT program participation. This study fills the gap, by examining the interplay of gender and individual, interpersonal, health system, and community factors related to participation in PMTCT programs.